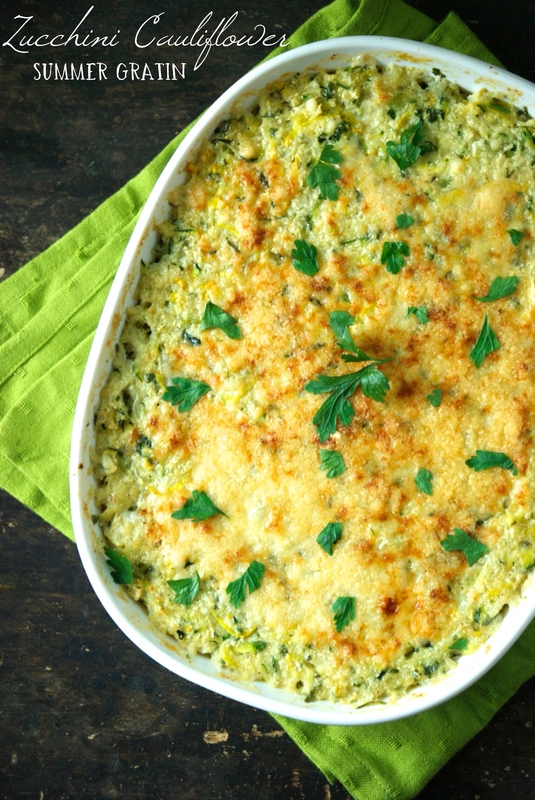 Zucchini Cauliflower Summer Gratin and a Giveaway! Zucchini is not my favorite vegetable. There, how’s that for an opening statement? It truly isn’t, or wasn’t, rather. It’s not that I really disliked zucchini, but in the past, if given the choice, I generally chose other ingredients to work with. I thought of it as bland and lacking “personality.” As it turns out, I’ve really come around to enjoying this wonderfully subtle vegetable. It just took a little coaxing from a very good, very talented friend. 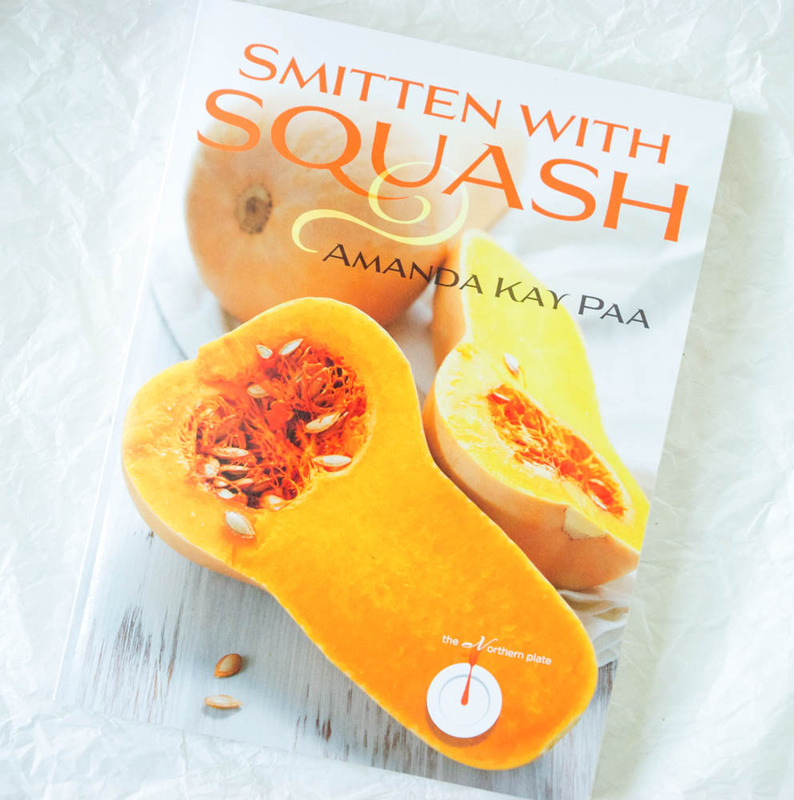 My friend, Amanda Paa, from HeartBeet Kitchen, has just published her very first cookbook, “Smitten with Squash”, dedicated entirely to that vegetable. I first met Amanda a few years ago at a mutual food-blogger friend’s cabin. I loved her ever-present smile and her calm demeanor. She was chopping vegetables endlessly in the kitchen and more than happy to be doing so. To say this girl is lovely doesn’t do her justice. We both belong to the group Fortify (a local food group), so we continued to run into each other at events. We eventually discovered that we live just a few blocks from one another. 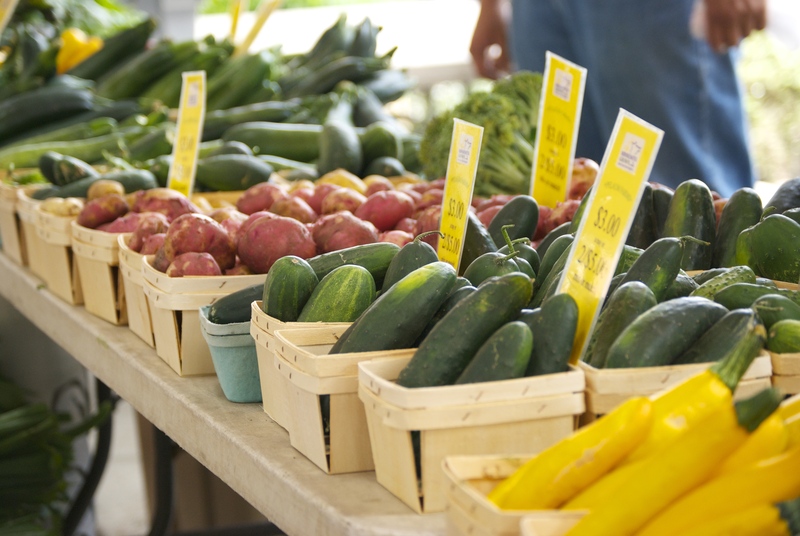 We frequent the same restaurants, coffee shops, and farmers markets, and we never ever tire of talking about food together. We’ve become wonderful friends and I couldn’t be happier to share a recipe from her new cookbook with you! It’s fun to have the inside scoop on someone’s book-writing journey. In some small way, it made me feel like I was part of it. She worked so hard and spent much of her winter huddled-up writing. The result is this wonderful book full of recipes for both summer and winter squash. Sweet or savory, she’s covered it all and then some. If you’re looking for inspiration for this particular vegetable, this is the cookbook you need. During her creative process, I had the opportunity test a few of her recipes. 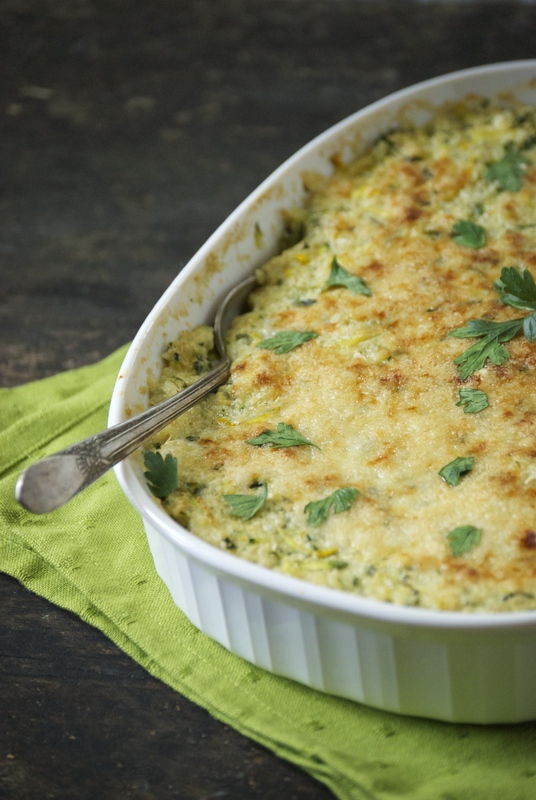 This wonderful zucchini cauliflower gratin is a heaping dish of chopped vegetables seasoned with herbs and parmesan cheese. There is just enough cream in it to give it a proper gratin feel, but the added milk keeps it from being too heavy. And every single bite is laced with just enough rosemary to keep you wanting another. Lastly, the parmesan crust on the top adds a little cheesiness, with a nice contrast in texture. I pile this gratin high on my plate with no regrets. It’s perfect paired with a grilled meat and a glass of wine. Not to mention my kids and husband all love it, too. I’m giving away a copy of Amanda’s book to one lucky reader (only in the US– sorry)! You want this book, you really do. She gets so creative with this vegetable– you’ll want to cook through the entire thing. Even if you aren’t the winner, I would encourage you to order it from Amazon or Barnes and Noble— you won’t be disappointed. To enter, follow the instructions on the Rafflecopter link below. Good Luck! And to you, Amanda– I am so happy to call you a friend. You are one of the most selfless and giving people I’ve met. Congratulations on your beautiful book– I’m truly excited to see what comes next for you. Update: The winner is Carolsue Anderson! Thanks to all who entered. Prepare the cauliflower by removing the core and breaking the rest up into smaller pieces. Then, using a food processor (or a sharp knife), pulse the cauliflower until they are tiny pieces that resemble rice grains. Be care that the mixture doesn’t get mushy. You may have to do this in batches. You should yield about 3 1/2 cups. Preheat oven to 375°F. Lightly coat a shallow baking dish with olive oil and set aside. 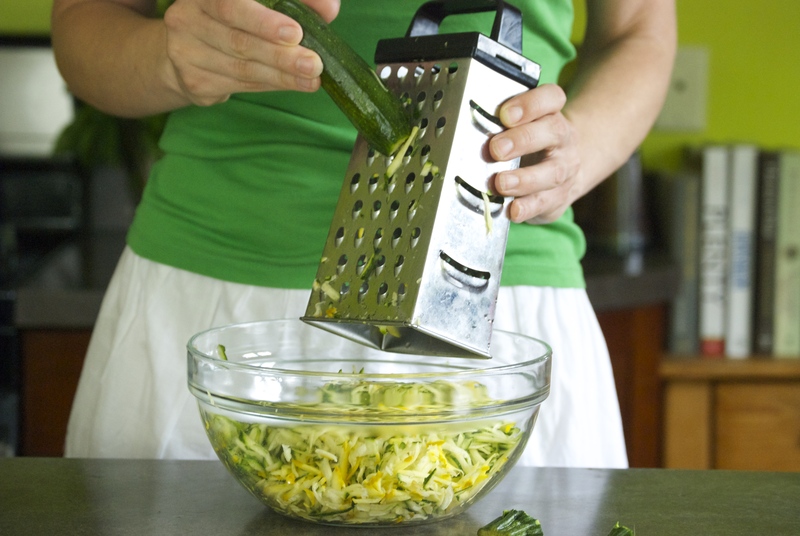 Stir 1 teaspoon salt and grated zucchini together, then place colander set over a bowl to drain. In a large skillet, heat olive oil over medium-high heat, add onions and a big pinch of salt, and cook stirring, until softened, about 4-5 minutes. 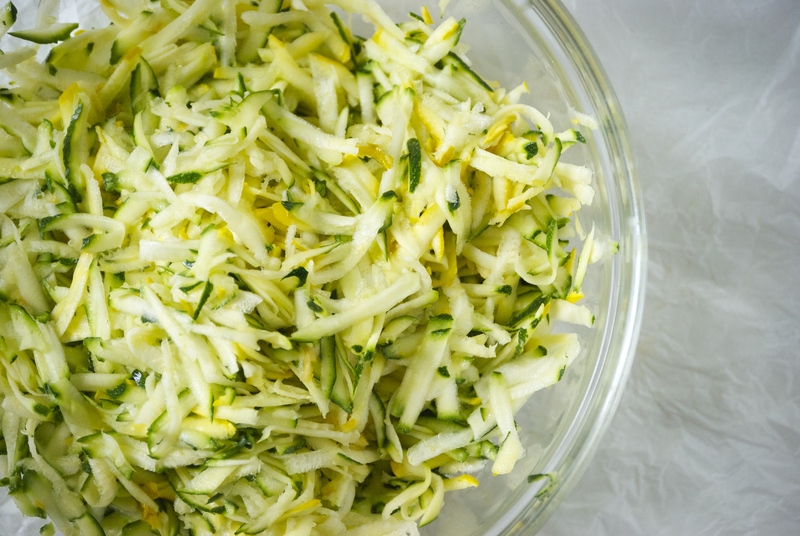 Meanwhile, squeeze handfuls of zucchini over a bowl to catch the juices, removing most of the water from the zucchini, yielding 2/3 cup shreds. 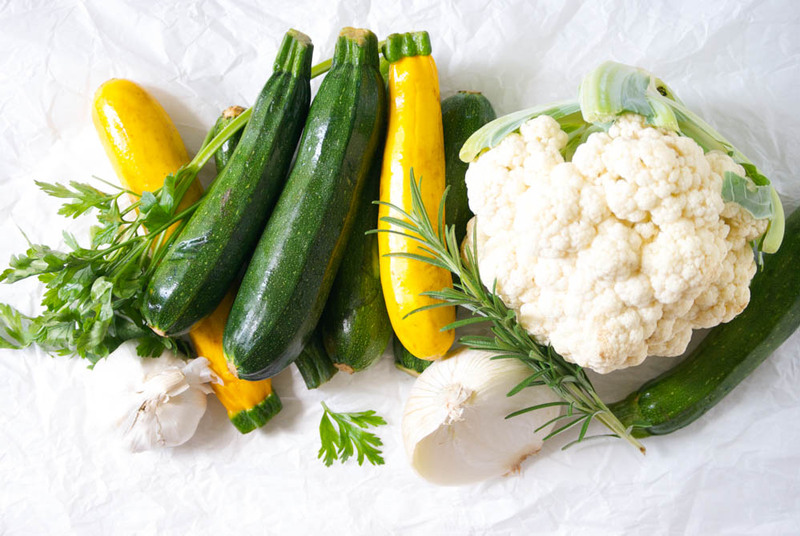 When the onion is softened, reduce heat to medium and stir in the cauliflower, garlic, zucchini, 1/2 teaspoon kosher salt, and pepper. Cook for about 7-8 minutes, until the vegetables are softened. Sprinkle flour over the mixture and stir to combine. Gradually stir in reserved zucchini water, milk, and cream, maintaining heat at medium so dairy does not curdle. Cook for 2-3 minutes so liquid absorbs slightly. Remove from heat. 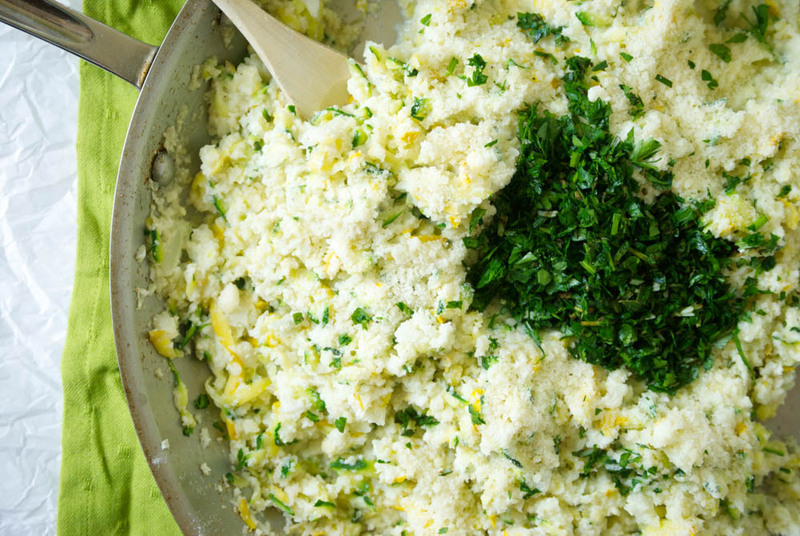 Stir in 1/3 cup parmesan, rosemary, and parsley. Pour into prepared dish and bake for 20 minutes. Remove from oven and top with remaining cheese (or more, if you like). Return to the oven for another 10 or so minutes until gratin is brown and bubbly. Sometimes I put the gratin under the broiler to brown up a bit faster for the final minute or two. Enjoy! 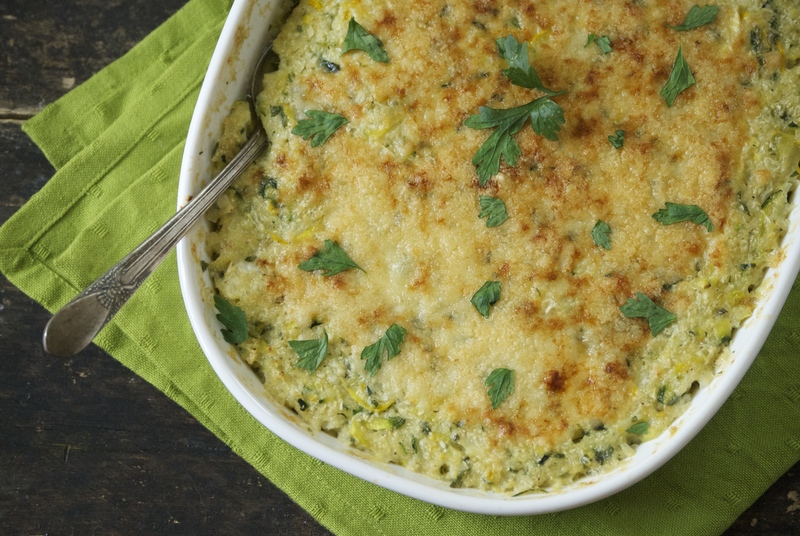 Check out these other great blogs for more recipes from “Smitten with Squash”. If you happen to live in the Twin Cities, be sure to stop by Solo Vino in St. Paul from 5:00-7:30 this evening for Amanda’s first book signing– I’ll be there, too! Looks great, Laurie! Like you, I haven’t always loved zucchini but I’ve been make zucchini noodles lately and loving them! See you both tonight! This looks heavenly. I can’t wait to see the whole book! I make a zucchini bread. My 8 yr old nephew is not into veggies but he loves the zucchini bread I make. I usually double the amount of zucchini and take out some of the sugar. He doesn’t know I am making it better for him. I make a spicy zucchini and chickpea curry that I look forward to every season. What a great looking dish! What a blessing to have a friendship where you can share your passions, and she lives close too! I really like to make Zucchini Chocolate Chip Cookies from the recipe in Barbara Kingsolver’s book, “Animal, Vegetable, Miracle.” In fact, I was planning to blog about it this week! yum love a good gratin, never made a zucchini one before. definitely need to trial this in my kitchen! I love zucchini just grilled with some fresh herbs. I eat it for breakfast with eggs, and sometimes I dip it in homemade ranch! Can’t wait to make this for our next family get together! this looks great! I have a head of cauliflower in my crisper and have been looking for a good way to use it! Looking at the recipe, I’m wondering why you squeeze the water out of the zucchini, only to add it back in later? Excellent question. I tested it both ways, because I was curious too. Each version yielded the same result. I didn’t want to change Amanda’s version, so I left it as it was written.